Recent studies in Taiwan and England have been producing disturbing results for people suffering with Multiple Sclerosis. The study in Taiwan is showing a direct link between chronic MS and an increased risk for developing certain types of cancer. England is found a genetic variation that links MS to a specific type of cancer. Both of these new studies appear to refute past research which had indicated that there was no observable link between the two disorders. While this may appear to be bad news for people suffering with Multiple Sclerosis, a better understanding of these two diseases, and how they interact with one another, is a step forward in prevention and treatment. Multiple Sclerosis is an autoimmune disease that affects more than two and half million people worldwide. The causes of MS remain undiscovered, although recent studies do indicate that the combination of a genetic predisposition and certain environmental factors may increase the risks for developing the disease. Multiple Sclerosis is a chronic disorder in which the immune system incorrectly attacks, and damages, tissues in the central nervous system. 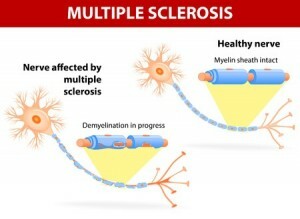 Over time, MS strips away the protective myelin sheath which covers the nerve cells. Ultimately, this leads to a decreased, or interruption, of the nerve signals sent throughout the body. The symptoms of MS are many and varied, but the most common are chronic fatigue, loss of visual acuity, abnormal sensation, and impaired mobility. One of the reasons the link between cancer and Multiple Sclerosis has been ignored for so many years, is that the most common symptoms of Multiple Sclerosis mimic the earliest symptoms of the onset of many types of cancer. Consequently, many MS patients who are in the earliest stages of cancer often go undiagnosed, with their symptoms being attributed to their chronic autoimmune disorder. Ultimately, when the cancer fully manifests itself, investigation into the cause of the cancer is secondary to treatment. The most recent research into the connection between autoimmune diseases such as Multiple Sclerosis and cancer would seem to contradict earlier studies. Previous researchers found no direct link between autoimmune immune disorders and an increased risk for cancer. However, Dr. Sun, head of the research project in Taiwan, explains that this could be due in part to the nature of the cohort groups examined in his team’s studies. Asia, and Taiwan in particular, has a lower incidence of Multiple Sclerosis as well as cancer. Consequently, the cohort groups assemble for the Taiwanese studies offered researchers the opportunity to examine people who apparently had fewer genetic and environmental predispositions for either disease. This led to a cleaner, and possibly more revealing, cohort group. While the recent studies in Thailand show a distinct link between Multiple Sclerosis and cancer, they have yet to isolate any causal factors. As mentioned, researchers in Great Britain may have found a genetic variation that links MS to a specific type of cancer – namely, Hodgkin Lymphoma. Researchers in London studied the DNA of a group of 12,000 volunteers. What they found, were two genetic variants that are linked with the increased risk for developing Hodgkin Lymphoma. Both of these genetic markers are also linked to the development of the immune system. These variants have been linked to the gene that helps to develop cell-mediated immunity. This same gene is known to be indicative of a higher risk for Multiple Sclerosis and other autoimmune disorders. The researchers in London posit that this might explain why Hodgkin Lymphoma, and other cancers of the blood, seem to occur in clusters in certain family groups. While this is only a first step in discovering the link between autoimmune disorders and cancer, it points the way to new research which could soon provide more of the answers researchers seek. The links between Multiple Sclerosis and cancer remain unclear. However, recent studies are showing that the assumptions made by earlier research teams may have been wrong, and that there is a definite link between MS and other autoimmune disorders and the development of different types of cancer. More research into the link between Multiple Sclerosis and cancer will have to be completed before we fully understand how the two diseases may be linked. But knowledge is power, and the more we learn about these two diseases the closer we come to being able to prevent, and successfully treat, both Multiple Sclerosis and cancer. It is most important to know that your health is not controlled by your genes but by the environment the cells are exposed to. Change your environment and you will change the genetic outcome. Genes are turned on and off by the environment.